The criteria in this table are indicators from IBA’s 2017-18 Portfolio Budget Statements and are aligned to the key elements of IBA’s purposes. The approach and criteria to performance measures have been revised since the 2016–17 corporate plan and portfolio budget statements, to better demonstrate and achieve our purposes. Is calculated as the sum of the rolling twelve-month average of all Indigenous employees of IBA. Is calculated as the sum of (i) the rolling twelve-month average of all Indigenous employees of IBA subsidiaries and associates (to incorporate seasonality changes); and (ii) the number of Indigenous employees within IBA’s businesses finance customers (recorded annually). Total dollar value of goods and services procured from Indigenous businesses by IBA and its subsidiaries and associates. Regional areas derived from Australian Bureau of Statistics Remoteness Areas, coinciding with ARIA (Accessibility/Remoteness Index of Australia), with Remote and Very Remote collated into ‘remote’, Outer and Inner Regional collated into ‘regional’ and major cities classed as ‘urban/metro’. Customers include Indigenous co-investors, investment partners and those who receive investment-related support; customers receiving business workshops, support or business finance; and customers receiving finance or support relating to home ownership. Includes current Indigenous co-investors; Indigenous co-investors to whom investments were sold during the budget year; organisations that participated in capability development activities such as investment strategies and investment information sessions; and Indigenous investors supported through investment’s services. Includes investment workshops, business workshops, individual sessions and home ownership sessions. Number of loans, guarantees and other finance products provided for new home acquisitions (including purchase of residential land), property settlement, refinance and essential home improvements. Transition to mainstream lending arises where the customer refinances home finance with a commercial lender. Support provided by IBA to access mainstream lending includes loans, guarantees, deposit assistance and other finance products that enable the customer to access finance with a commercial lender. Total equity held, in aggregate, by Indigenous co-investors and beneficiaries in the budget year, expressed as a percentage of the total investment portfolio value. 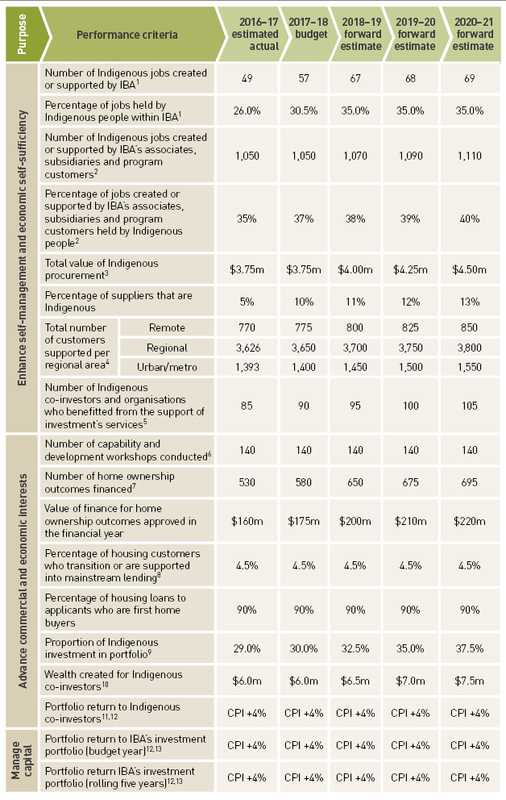 Indigenous co-investors’ and beneficiaries’ after-tax comprehensive income (including valuation increments and decrements). Portfolio return to IBA’s Indigenous co-investors during the year, calculated as the after-tax comprehensive income (including valuation increments and decrements) generated by Indigenous co-investors’ and beneficiaries’ interests in the investment portfolio in the budget year, expressed as a percentage of the aggregate value of Indigenous co-investors’ and beneficiaries’ holdings. CPI refers to the average consumer price index for Australia during the measurement period. For example, if the realised CPI for 2017–18 is 1.7%, the expected return based on a target of CPI + 4% is 5.7% (1.7% + 4%). Portfolio return to IBA during the year is calculated as the after-tax comprehensive income (which includes valuation increments and decrements) generated by IBA’s interests in the investment portfolio in the budget year, expressed as a percentage of the value of IBA’s holdings. Portfolio return to IBA over a rolling five-year period (inclusive of the designated year) is calculated as the average of the portfolio return to IBA in each of the past five budget years.